You’ll get all the essential materials for an aquarium in one convenient set. 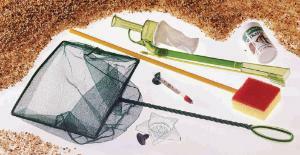 Contents: Floating aquarium thermometer Soft mesh dip net, 10" Long-handled aquarium scrubber Nutrafin fish food, 1 oz. Worm feeder Siphon/vacuum cleaner.